Have two drivers ever exemplified and represented their countries and their sport better than Scotland's Jim Clark and America's Dan Gurney? What Clark and Gurney did in their years together and the manner in which they did it had a certain special nobility about it that is the stuff of legend. 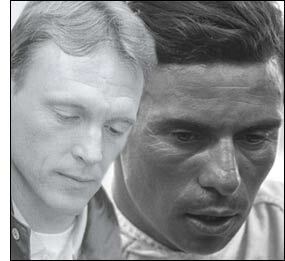 One of these men, Jim Clark, was tragically taken from us prematurely in a fatal accident; the other, Dan Gurney, is very much with us and is still actively involved in motorsports, most recently helping his son, Alex Gurney, come up the ladder from the Toyota Atlantic series to Formula One. If Clark had lived, his thick jet black hair would now have thinned out and have touches of gray, and he would in all likelihood be a gentleman sheep farmer on the cusp of his 65th birthday, on March 4th 2001. And about a month later, on April 13th 2001, his friend Dan Gurney would be turning 70 - which makes Gurney, in turn, just a few months younger than Bernie Ecclestone, who turned 70 back in October 2000. The purpose of this series on Clark and Gurney is to celebrate them both and the Golden Age of Grand Prix they did so much to make memorable, when teams somehow operated their worldwide escapades on shoestring budgets; when the Grand Prix cars had manual gearshifts, skinny tires, no advertising, no aerodynamic devices to speak of, but lots of experimentation to achieve mechanical grip; and when the drivers themselves were an interesting and varied breed of cat, no more so than our principal characters, Clark and Gurney. So settle back and celebrate the Sixties in Formula One, through the prism of two drivers who were at the center of that tempestuous and dangerous decade. Dan Gurney had a longer career in Formula One than the Flying Scot, but it is less well known. The tall, blond and handsome Californian (though a native New Yorker, born on Long Island) began his Formula One career in the best way imaginable for a rookie Grand Prix driver: at Rheims behind the wheel of a front-engined Ferrari Dino 246 for the 1959 French Grand Prix, having impressed Ferrari's American dealer, Luigi Chinetti, with his skills racing sportscars. Although always youthful looking, Gurney was already 28 years old (having served in the Korean War) and had fewer than 20 races under his belt. During the four Grands Prix he ran that year, he showed well, even at his first race at Rheims, where he was up to sixth place before going out after 20 laps. In the other races that year he was a standout for a rookie. At the historic and dangerous AVUS circuit near Berlin for the Grand Prix of Germany (where the race was run in heats), he finished second in only his second Grand Prix. He had a fierce struggle at the AVUS race with fellow American Masten Gregory, whose nimble rear-engined Cooper T51 stayed ahead of the Ferrari until Gurney subtly signaled his intentions by punting the Cooper offline in the South Curve, virtually climbing up the back of the Cooper's engine cover in the process. Gurney also got his first taste of death in Formula One that day at the AVUS, as his former Ferrari teammate, Jean Behra, was killed in a support race in the rain when his Porsche sports car vaulted over the railing of the high-speed North Curve AVUS banking. In his next race, the Grand Prix of Portugal, Gurney out-qualified fellow Ferrari teammate Phil Hill and finished third; in the Italian Grand Prix, Gurney finished fourth, in what turned out to be his last race for Ferrari. In 1960, Gurney made his first improvident judgment call, jumping ship from Ferrari to go to BRM, where the money was better and the engine was in the rear. In a year with disastrous results, Gurney finished a race only once - 10th place at the British Grand Prix. In the Dutch Grand Prix at Zandvoort, Gurney's brakes failed coming down the front straight, the BRM ran straight off the course at the Tarzan Hairpin corner and turned over, killing one spectator who was in a prohibited area, and injuring others along the way. Miraculously, Gurney was spared. It was also Jim Clark's first Grand Prix, and he was driving the Lotus 18 - the first rear-engined car for Lotus. Clark also retired from the race after battling with Graham Hill, Dan Gurney's teammate at BRM, who ultimately finished third in the race. This race was the first time all three of these drivers, who were to spend the 1960s together, were in the same Grand Prix. 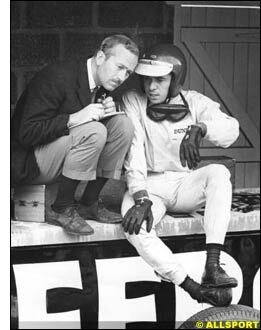 Before detailing how Clark and Gurney meshed in their careers, it is important to understand the breadth of a man like Dan Gurney, which was doubtless part of his appeal to Clark and the other members of the Grand Prix fraternity, including Gurney's many fans. On the face of it, Gurney's overall Formula One statistics are not all that earth-shattering: he participated in 87 Grands Prix from 1959 to 1970, won 4 of them, was on pole 3 times and had 6 fastest laps - about the same record as, say, David Coulthard before the 2000 season commenced. But what he accomplished in that time span was remarkable and validates the axiom that statistics can sometimes lie. To begin with, Gurney was versatile, both as a driver and a person, and approached his racing life with a zest that never left him, no matter how many disappointments he suffered, and there were plenty of them. It is often said that Stirling Moss is the best British driver never to become a World Champion; change the nationality to American and you have Gurney. Both never finished higher than second (Moss) and third (Gurney) in the World Drivers' Championship, but both deserved better and were often let down by the frailties of the cars available to them. Whether Gurney was driving his own Eagle-Westlake Grand Prix car at Spa and winning, driving the ground-breaking Lotus-Ford at Indianapolis, racing Carrol Shelby's Cobra sports cars at Goodwood, a Ferrari "Testarossa" at Sebring or the Ford Mark IV "GT 40s" at Le Mans, manhandling a Holman & Moody-prepared Ford stock car around Riverside Raceway in California for the NASCAR Riverside 500, or wrestling the Ford Galaxie "saloon car" around Oulton Park - he was always fast. What he lacked was racing luck, a mysterious quality that people like Fangio, Prost and Senna seemed to have, moving up to the right cars at the right time, but which the Racing Gods denied to Gurney. Although if he finished a Grand Prix, Gurney would usually finish in the points, appearing on 21 podiums, his cars let him down in over 50% of his 86 Grands Prix. Nonetheless, his career had many distinctions. Gurney did manage to take Brabham, Porsche and his own Eagle to their respective first wins, and his Eagle remains the only American Formula One car to have won a Grand Prix. He won Le Mans with Indy 500 Champion A.J. Foyt (like Alexander Wurz, Gurney was so tall that the closed-cockpit GT40 had a special blister panel cut into the roof to accommodate his head) and invented celebrating such victories with champagne at the Le Mans triumph, a now time-honored tradition that is customary in every Grand Prix. Gurney believes that he is also the one who gave Colin Chapman the idea for the reclining position in modern Grand Prix cars, when one day at the Lotus factory, Dan was attempting to fit his lanky frame into the confined quarters of a Lotus sports car he had purchased - a Lotus 19 - and ended up adopting a reclined position to fit himself in the car! Chapman took notes. Gurney is also credited with coming up with the CART acronym for Championship Auto Racing Teams, of which he was one of the founders. He also was the first to use the full face Bell Helmet in Grand Prix racing at the 1968 German Grand Prix. And the "Gurney Flap" wickerbill found on the rear wings of open wheel cars of all kinds is named after its developer, Dan Gurney. And like very few Grand Prix drivers, Gurney had an entrepreneurial side that manifested itself throughout his career. Incredibly, he was barely 30 years old and had been in only a handful of Grands Prix and no Indy 500s when he had the insight and the political savoir faire to put executives at Ford Motor Company and Colin Chapman of Lotus together at Indy in 1962, an alliance that led to the successful rear-engined revolution at Indy. He believed so strongly that Ford and Lotus would be a match made in heaven that he did the unthinkable for a driver, then or now: he paid Colin Chapman's airfare for him to come to the Indy 500 in 1962 to see what it was all about. After the Lotus-Ford era ended, Gurney began his own company, All American Racers, with another of his ex-bosses, Carrol Shelby, and launched the long line of Indianapolis-style and Grand Prix Eagles that were among the prettiest and fastest cars of their era in both of those open-wheel worlds. His Indy Eagles won three Indy 500s (driven by others). Once Gurney retired from Grand Prix racing, he continued to produce beautifully prepared Toyota-powered GTO/GTP cars as well as a Toyota-powered Eagle Indy car. In all of these cars, there was a continuity back to the gorgeous 1967 Eagle-Westlake with its subtly peaked nose. All the spectacular-looking Jordan Grand Prix yellow paint schemes of the late 1990s with animal/bird/insect motifs on their bodywork can track their pictorial origins back to Gurney's Eagles. 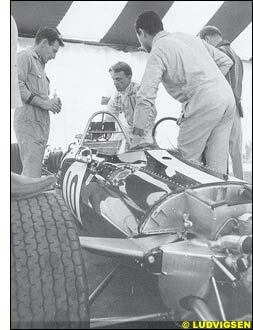 How and when did Jim Clark fit into Gurney's life and career? As indicated, it all started with Lotus, Ford and Indianapolis in the early 1960s. Clark and Gurney were on different teams on the Grand Prix circuit at that time - Gurney with Ferrari, BRM, Porsche and Brabham at various times, and Clark for his entire career with Lotus - but, extraordinarily, they collaborated and became teammates in other forms of racing, mostly through Ford connections. What did the quiet and reserved sheep farmer from Chirnside, Scotland have in common with the tall and gregarious Californian with the easy smile? Not much on the surface, you would think, but somehow while Gurney cut his racing teeth hot rodding around Southern California's orange groves or on the Bonneville salt flats, and Clark honed his skills on Sunbeam and DKW Sonderklasse saloon cars on wind-blown circuits in the wilds of Scotland, they somehow ended up in the same place: having an elegant touch at the wheel, passionately committed to the life of a racing driver and totally uninterested in the politics of Grand Prix racing. "You should also appreciate that Jimmy and I were on remarkably good terms for teammates ... By the nature of racing, teammates generally hate each other. They have to. It's an almost inevitable part of the job because each is trying to out perform the other - to prove himself top dog. It is part of the inevitable psychology of the situation. "But in Formula One at that time, Jimmy and I were racing against each other almost every other weekend - he for Lotus, me for Brabham. We had a clear idea of each other's capability. We shared an awful lot of mutual respect; I thought an awful lot of him as a driver and as a man, and I think he reckoned I was OK too. So when we came together on the Indy programme we worked together just fine. "We both just enjoyed racing cars and everything about them. We both enjoyed trying out different kinds of cars - Jimmy tried driving an American Stock car out of curiosity, and of course I drove them too. We both drive Lotus-Cortinas, which were a lot of fun, and we ran Indy cars on the road circuit at Riverside too ... We both got a real kick out of bringing together our two worlds of racing at Indy - the European-style road-racing design and USAC oval-track racing. "Going into Indy racing with something so entirely new was one hell of a challenge - there was no place for in-fighting, neither of us was political, and above all it was fun tweaking the Establishment's tail." Although Jim Clark's Grand Prix career (1960-68) was shorter than Gurney's (1959-70), Clark's statistics are much more impressive, since he was both a fabulous driver and happened to spend his entire career in the best car of the era - Colin Chapman's Lotus. Clark participated in 73 races, won 25 of them, had 33 poles, 28 fastest laps and was on the podium 32 times. Incredibly, he was on the front row of the grid 48 times and led 43 Grands Prix. He was World Drivers' Champion in 1963 and 1965, and almost won in 1962 and 1964. For all of his seemingly effortless success at the front of the field in his Lotus as he is most often remembered, Clark had a number of memorable races that he did not win; some of these spectacular performances were against other drivers, and in some of them the main competition was himself or the clock or his own high standards. Next Week: 1960 through 1963.